There is no shortage of diversions on the App Store, but why waste our free time on some mindless grind when we can enjoy a colorful puzzle that not only entertains us but also puts our eye to hand coordination and reflexes to the test. Meet Colors XYZ! Colors XYZ gives us four different game modes, all with three levels of difficulty to choose from. The modes are: Infinite, Bomb, Waterfall and Sort. In Infinite the goal is to stay alive as long as possible, infinite if you can! You are given the task to tap the correct dot, the one matching the color of the central dot, as fast as possible before it fades away. The Bomb mode have you doing the same but you also need to keep away from the bombs that appear at random times, and collect the stars that help you advance in the next levels. The Waterfall mode consists of many falling dots and you need to tap the ones matching the color of the banner. And finally the last mode is Sort. Sort requires you to swipe the falling dots right or left depending of their colors so they can fall in the correct bucket on the bottom of the screen. Every one of the modes gets more challenging as time goes by. But there is more, each point you earn can be spent unlocking some of the 32 reward themes, all different and fun, which give you the ability to turn the dots to many things, from disco balls to donuts, the choice is yours. Why is Colors XYZ our choice? In the sea of mind puzzles, brain training apps, reflex sharpening games, Colors XYZ gives us all and more with simple concept, great execution and colorful design. The levels are infinite, so is the amount of fun we got. The different themes spice things up and kept us motivated in earning the points as we tapped and swiped our way to sharper minds and quicker reflexes! 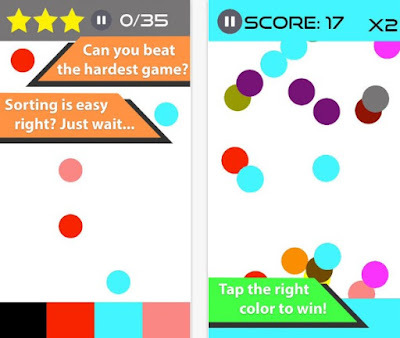 Challenge your brain and improve your focus, download Colors XYZ at the App Store for free!